Aotea is the original name of Great Barrier Island, Motu Aotea, and the name of one of the Maori Great Waka and the harbour where it first landed. It is also the name given to the what is likely to become the most important station on Auckland’s metro system. Anyone who has followed the arguments for the City Rail Link here will be used to us stressing the importance of a decentalised network. How a key benefit of the CRL is that it will liberate the system from its current structural focus on Britomart and all the limitations that this network shape causes. How the through-routing and the new services and stations of the CRL will unlock the existing spare capacity in the rail network that is currently dormant. These are the main ways in which this project will be transformational of Auckland’s very shape. So it may seem a little strange to see me picking out another station as the prima donna. Well bear with me, because I don’t see how it can avoid becoming so prominent, and I don’t see this as a problem. But I am concerned that whatever we build here doesn’t limit its great potential as the primary place for people from all over the entire region to enter the CBD. In other words this station needs to be designed to be able to grow with the network. Here is a description of the CRL station as currently planned; on this previous post. You can see it will be the most centrally sited station, the closest to the middle of town, the Universities, to the restaurants and other ‘delights’ of Sky City, Aotea Square and its cinemas and and of course all the employment and business in the heart of the CBD. So I am picking it to quickly rival Britomart for patronage from the existing lines and the next planned line to the airport. All will have direct services passing through here. It’s going to be mad busy, will flood these city streets with people and life and will therefore be an interesting design challenge. But it is looking a little further ahead where we can see the dangers of underestimating the sheer numbers who could be using this station. 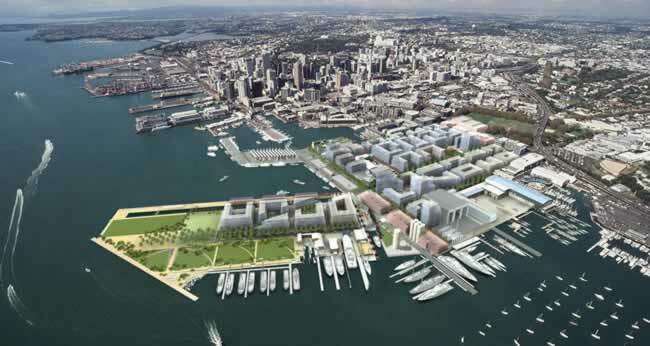 Here is the latest plan for Wynyard Quarter by Architectus. The east west spine of this plan opened last year to enthusiastic reception. Many people drove down there and parked on the currently empty sites to use the new promenade. The first of the new office buildings is currently under construction; a new headquarters for the ASB Bank. All of those new buildings and streets are planned to contain little or no car parking. Many of these sites right now are carparks, and will steadily be replaced by buildings. There is no chance at all that this new area as well as the rest of the expected growth of the city can be served by growing the numbers of cars entering into the city, as there is just nowhere for any additional roading to absorb this growth. Nor will the streets be able to take the vast numbers of extra buses that this kind of development would require if we try to rely on that mode alone either. This area in particular is really an island cut off on its southern boundary by the extremely busy Fanshaw Street, and with nowhere to add any new road capacity. Now, we’ve got a bit of time to get this right but the fact remains that the only plausible answer to meeting this area’s needs and making the whole scheme viable is to provide the kind of system that can move thousands of people around the clock without adding further to the already full streets. Luckily there is a plan: A new line from the North Shore to an underground station in the heart of Wynyard Quarter possibly running north/south under Daldy St, that then heads on to, you guessed it; Aotea Station. There are various options for this line, where it stops on the Shore, what kind of train it should be. But almost all schemes call for it to meet the CRL on separate platforms running perpendicular and below the proposed CRL Aotea platforms, probably under Wellesley St. So Aotea is not only likely to be the busiest CRL Station but also to be the main point where North Shore users access the city side of their own line as well as a very busy point of transfer between lines. There are many fantastic advantages for Shore residents and the whole city with this plan. The speed and certainty that people will be able to move between these places and then onto further destinations on the rest of the network or by switching to buses will be revolutionary for Auckland. The constantly growing busway already shows that the demand is there from the Shore and the development of Wynyard Quarter and the location of Aotea Station mean that there will be no lack of demand from the city side either. Of course crossing the harbour will be expensive but with this technology it will considerably cheaper than building any kind of new road crossing and of greater benefit because there is just no chance to accommodate any additional vehicles in the city or the local roads of the Shore. It may seem that I am looking too far ahead. Not even the current North Shore Councillor appears to believe this is possible or desirable, let alone all the big men in Wellington. But I am certain that once the new trains and especially the CRL has transformed Auckland into a true metro city the disinterest of many in areas not currently served by rail will change to a desire to have their own access to the system too. Really looking further ahead there is the option of extending the line out of Aotea Station and across the city under the University to link up with the Eastern Line at the old railway yards and then even out to the car jammed neighbourhoods of Pakuranga and the rest of southeast Auckland across the Tamaki River [another of Nick’s suggestions]. Here’s a map with a whole range of potential options for Auckland just to show what we could do if change our priorities. The black lines may remain bus routes, and the Blue Line out west is more likely to be a busway for a good while too. While it is not clear what we will choose to do in the future it is important not to close off those choices by assuming that the conditions of today are permanent. One thing is pretty clear and that is that Aotea Station has the potential to be very very busy and very very useful. Best not to undercook it from the start. That’s it. If AT won’t build this, I’m just going to start without them. I’ll be at Aotea square tomorrow morning with my spade digging a hole. haha, I’m with you too David, but don’t dig there you’ll only find cars hiding under there; a little up the hill under Albert St. And AT and AC aren’t the problem. The problem are those big men at the Beehive. But one day they’ll be gone like leaves off a tree….. forgotten. I’ll join too with the spade and bring the Coffee Machine too. 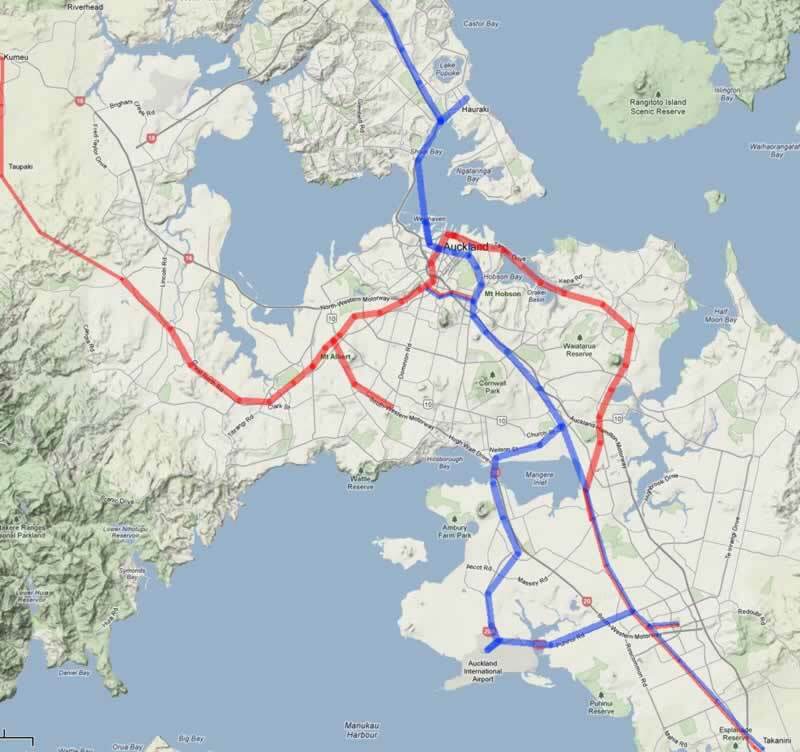 So this is what the Auckland Rail/Bus Primary Network could look like. 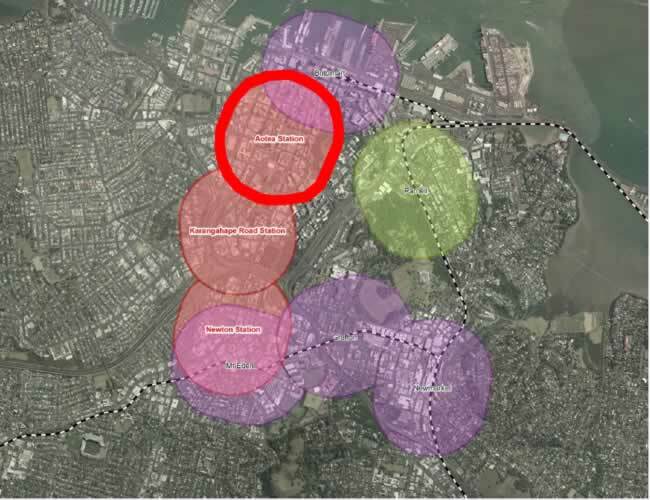 Just one spoke missing but that can’t be done until Auckland Council makes up its mind about Port of Auckland. Right – copy diagram, paste it into paint, save it, print it. Sorry needed some material for elections next year and 2014 😀 when all of us can put our spades down for a few moments and go grill candidates. Just one thing, total cost of this please even if it is an estimate? This is a great post that should get people excited about what the train system could be. If Auckland wants to be taken seriously as a city on the global stage then it should be aiming for a metro transport map that looks very similar to the one posted above within 20 years. It’s a great idea which will add vibrancy and community to the sprawling mess that passes for Auckland’s city centre. Which is probably why some Range Rover driving neo-con politician will flush it immediately. That’s a wonderful schematic Patrick. It certainly got me excited and then laughing, sadly. Maybe 100 years on, but it would be great to see some of these links built. A light rail line out to Titirangi might be an idea. Ben- Struggling to work out how this has any relevance to the Ports? One question- Wouldn’t the far cheaper option be a skyway/light metro that runs along the “bus lanes” on our existing bridge? They can enter and exit at Fanshawe St, picking up the Wynyard crowd and on to Aotea or Britomart (or both) to join the rest of the system. -> Savings of X billions for one new tunnel/bridge that we all know isn’t really needed? Well the inclines are tricky and the bridge is pretty full. This gives us a huge amount of extra capacity without disrupting the current setup, except when upgrading the busway proper, and will take a lot of buses and cars off the bridge so it can operate better. It should reduce the City to Shore loads especially at peak considerably, allowing the Bridge to function as a key part of the State Highway system much better. Doubt we can load more onto the bridge, except cycling and walking of course under the clip-on…. That’s gone very quite of late hasn’t it? Anyone know what’s going on with ‘getacross’? It has EVERYTHING to do with the Ports or am I the only one seeing this. First question to be asked: Where is the port going to be located? Current spot or somewhere else. The review from Auckland Council is under way on that question and to me either choice has serious implications to that diagram above. Second Question: How do you deal with freight as passenger trains share the main lines with freighters. Already we have conflicts and regardless of the third line you will still have conflicts at Wiri, Southdown, the Eastern Line through to the port, and the NAL to up north is you guys are serious in keeping freight moving on rail to Northland OR POAL shifts to Marsden Point kicking all the freight on that line. Ben if you read Nick’s post carefully on the Shore line and beyond you will see that he is proposing added a pair of Light Metro tracks for the new line from Aotea to Manukau. Thus completely avoiding any conflicts with freight. Patrick with respect errr where did he say that? I saw this [Really looking further ahead there is the option of extending the line out of Aotea Station and across the city under the University to link up with the Eastern Line at the old railway yards and then even out to the car jammed neighbourhoods of Pakuranga and the rest of southeast Auckland across the Tamaki River [another of Nick’s suggestions]. Link up, meaning the train is going to use the Eastern Line and run straight into a Port Shuttle? Fail that you still have Southdown where that massive Metro Port base is – err where you going to put the track for the Avondale Link with conflicting Metro Port. Again Wiri – the inland port as well… it was built on the wrong side so freight shuttles cross over blocking passenger services. We really want light rail running parallel to heavy rail? Ben ‘Light Metro’ is not compatible with our existing ‘Heavy’ rail system. So any new LM line cannot extend an existing line and run the same rolling stock. So If the North Shore Line was to be LM, and if we wanted to extend it all the way south through Pakuranga to Manukau [I know the map shows it going to the airport but it was made before Nick’s suggestion] like the last map shows, then it would have to be on new track on the eastern desination to GI then new track and ROW to Manukau and transfer. This would have the advantage of total grade separation of this new capacity from the existing freight route. It would be a step towards freight having its own line. As to Southdown etc, it seems to me there is plenty of room for additional track on the southern ROW when required so I don’t think that is relevant much to this thread as it is more a pure Kiwi Rail issue and not a metro AT one. Why oh why did we choose Narrow gauge over Standard for the rail net? 1) That light metro need not be subject to the design constraints of a main line railway (that has to take freighters or other locomotive hauled trains) so grades can be steeper and curves tighter, which means much cheaper to retrofit into existing corridors. 2) Driverless operation, which massively cuts marginal operating costs and allows very good frequencies to be run all day on a limited operations budget. So the construction costs are lower than regular rail, operating costs are likewise much lower, but the speed, frequency and span of service is at least as good (and in practice probably far superior due to the operating cost savings: much more service to be had for the same price). The flip side of this is that they cannot run on existing tracks where there are any non-automated trains and the route must be entirely grade separated and sealed, i.e. it is suitable for new lines only. Anyway my concept for using light-metro on the outer-eastern line is as follows. A new line is constructed from Manukau Station up the centre of Te Irirangi Drive to Botany (the three main intersections on Te Irirangi would be grade separated, which would also provide good locations for bus transfer stations). From there it would carry on along the eastern side of Llyod Elsmore Park, with stations at Cascades Rd and Highland Park. From there a short tunnel under the ridge would lead to a bridge across the Tamaki River (also carrying walking and cycling paths) then carrying on to the reserve that leads to the location of the old Tamaki Station. From there the light metro tracks would run in the Eastern Line corridor alongside the existing tracks (with stations at GI, St Johns Rd, Meadowbank, Orakei and probably one near Quay St somewhere) then enter a second city tunnel in the vicinity of the Strand running to east-west platforms at Aotea with onward routing to a similar North Shore line and/or one in the Northwestern corridor. Yes we do want light metro in parallel to heavy rail. The benefit of this is it allows the existing two heavy rail tracks to just carry port freight and intercity locomotive trains leading in to Britomart. Meanwhile all suburban passenger demand is carried on the dedicated metro tracks. So instead of building a third/fourth freight track to the port, we use the existing ones and build purpose-built metro tracks instead. One benefit of this is it allows us to add in stations that would suit the passenger network but are otherwise difficult/impossible to have with heavy rail, i.e. a station near the intersection of St Johns Rd/Kohimarama Rd and St Heliers Bay Rd is ideal for a transfer point, but a heavy rail station would need to be right down in the bottom of the gulley while light metro could easily climb up to just under the road. Basically the concept is to build all new lines as dedicated passenger metro, and focus all freight and intercity traffic on the existing trunk lines. As this is a plan for the future type discussion, how do people think about making rail bicycle friendly. I’ve seen it in Toronto where bicycles are allowed to be taken onto the train at off peak times. If the train station and carriages can be designed to accomodate bicycles at peak then the effective range of the station increases dramatically. What do people think? Is it a nice to have, a good idea or one that should never be mentioned again? I think you’ll be pleased. All good, except you’ve missed Beach Haven Central station. You’ll be wanting a ferry terminal first I reckon… supposed to be a service coming to Hobsonville soon, get it to stop on your side of the creek too, sweet. There used to be a ferry here. I’d like to see it restored, even if it’s only a 60 minute service. One problem with Beach Haven Wharf is there’s zero parking and the local street isn’t an easy one to deal with a traffic influx. Also the wharf is a fair step for most local residents. Yes I’ve been there, lovely sleepy little out of the way cove with a sense of time travel about it: Old pohutukawas and people fishing off the wharf. Surely best to arrive by boat and way more direct than driving. And you’re right; no chance of a park and ride setup there. What has to happen then is local buses timed to meet the ferry; should be possible and especially when integrated fares get implemented it should also work. Get your local board to raise the issue of both ferries and buses with Auckland transport. A ferry service linking Hobsonville and Beach Haven to the CBD is on the cards, expect to see that fairly soon. In either case there will be minimal parking, it’s just to expensive and difficult to provide any meaningful level of park and ride at wharf locations. Each carpark occupies about 30m2 overall, so thats a lot of prime waterfront land or roadspace just to fill one ferry. What we’ll (eventually) see instead is a collector bus timed to meet each sailing, or perhaps some more regular routes extended to service the wharves. I used to catch the collector bus at Birkenhead wharf when I live in Chatswood. It was a great service, if a little under-used, but there were two problems. 1. When the service changed it became way too slow – I could almost walk home in the time it took to travel 3 and a bit KM. 2. It would only take cash for the fare – a through ticket would have worked wonders. Hey Patrick, that plan looks great! Being a regular train user on the Western Line I’m all for a better and wider rail system. I’ve always envisioned a system of interlocking circle lines. Not everyone uses rail to head to the CBD so a system of circle lines would be handy for college students and workers in their respective areas. But yeah, this is awesome. Nice one! Thanks Manny, great to hear from regular users. Yes a less Britomart focussed system is the aim; it should be more open to a bigger variety of destinations, not so bossy! So what’s your route? My route is Fruitvale Rd or New Lynn Station to Britomart. I work in the K Rd area though so a stop nearby would be very handy. And not going to Newmarket would be a good thing…in more ways than one (jokes). How bout a network of circle lines around West AK, South, East and North that all interlock with a circular Central line? Just a thought. I recommend you have a look at the “Human Transit” blog for a detailed discussion on why circle lines are quite problematic. I couldn’t find the ‘circle line’ blog but I can guess how it would be problematic. Maybe the central line should be a circle line, like the link bus system, and the western, eastern and southern lines should connect at different points on the route. This is a great blog btw. I’ve been moaning about our train system for years! In fairness circle lines can be effective from a passenger perspective, but tend to have operational issues. It is loop lines (i.e. one way loops) that are really problematic for passengers. True. Patrick’s plan is pretty much spot on the more I look at it. The Aotea connection from the Western line and the red Westgate/Botany line are essential to unlocking everything. I’m sold. Great plan. 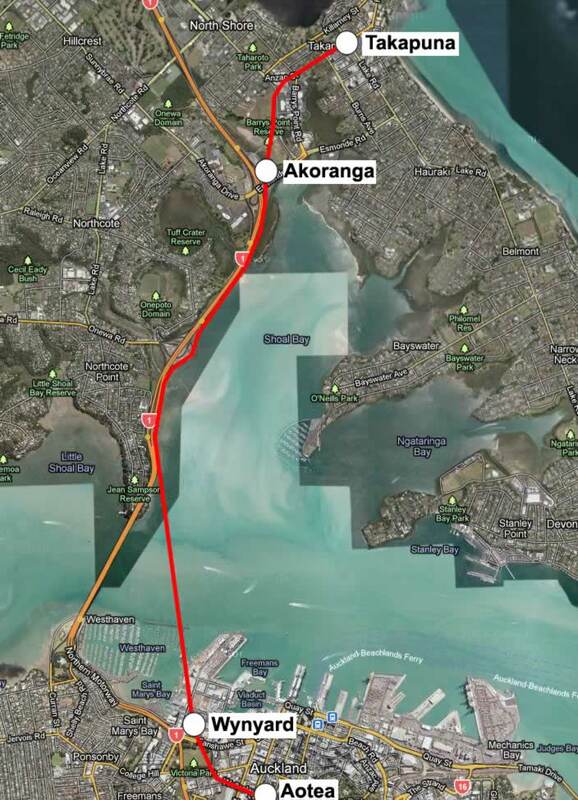 Any idea of how long it might take to get from Botany to Aotea with that red rail line in place? At the moment it’s about an hour on the bus for a distance of (as the crow flies) 16 kilometres. So 16 kph!!! 26 minutes Botany to Britomart. Wow. That would provide me with an extra hour a day! Exactly, this is what Transformation means. These systems will completely change the shape of our city and our lives. Can’t afford a house in Ponsonby? : Well with that trip time Botany is looking a hell of a lot more desirable. What will that do to relative dwelling values? You want irony? : I’m an inner city house owner giving vast amounts of time and energy advocating systems that will add value to further out bits of Auckland by transforming their connectivity and I’m up against the elected and paid representatives of those very places; like Quax and no doubt the kid MP, or Wood and Barry on the Shore….. go figure. I used to live in Grey Lynn for many years but moved into the western suburbs because I couldn’t afford to buy a house in central AK. Anyway, to cut a long story short the goal was to buy an affordable house near a train stop (New Lynn). That was 10 years ago, and the new train station in NL only opened last year. The progress has been slow but the new developments around the transport centre has added some spark to the ‘crown lynn’. All the traffic comes from the outer suburbs so a decent rail system, one that will get people off the road and onto trains is important for our city’s future…but you know that. Anyway, keep up the good work! I agree that Aotea station will be great. Your long-term plan highlights how small Auckland’s train network actually is. If we do see heavy rail across the harbour, it should be extended to Warkworth Wellsford, where it would meet the NAL. This would service the growing population in Warkworth that has no choice but to drive into Auckland, and would probably be attractive to freight trains as well. That should be ‘Warkworth and Wellsford’. I still think that it’s best to have the entire network running with the same rolling stock and same type of rail on all lines, it just makes it so much easier. I like the idea of having light rail next to the western motorway, and the AMETI project, and dominion road light rail, but I really think that north shore should be heavy rail. Depends more than a little on the cost savings don’t you think? As it may be the difference between getting the route built at all or not. It is essential that whatever we build and then need to operate must be as cost effective as possible, especially because the evaluation of what we should build is not on a level playing field. For example any intelligent analysis of how best to increase access across the harbour would conclude that the missing mode of rapid transit is what should be built next for the reasons, among others, that mention above, like; where do these cars all go on either side of the harbour after they’ve crossed it? So the argument then would be about the best detail and design and above all about the timing. But because of the false god of user-pays the road lobby and its champions in government will push an awful road system on the city with the argument that highways have their own money. They don’t. It is merely government policy that the National Land Transport Fund almost all goes to State Highways, and new ones at that. They all continue the as if their policy was carved onto tablets by Moses. That any additional road crossing would be eye-wateringly expensive as well as street cloggingly useless is our best hope in the battle to stop it. And not just capital costs. Driverless light-metro has huge operational cost savings over conventional heavy rail. With current technology, any weight or gauge can be driverless. Advances in technology, and experience in deployment mean that this will increasingly be the case. Advocating for driverless operation on cost grounds is a good example of how freakin’ skewed our economic system is. A light rail system without a driver (and presumably without anything like a conductor either) is rife for vandalism, fare evasion, all sorts of public nuisance and damage. And all that because we are unwilling to give human beings a wage, and accept that the guy can then go home and feed his family (and feed the money back into the local economy) after having given a service to the community by keeping public infrastructure well-operating. No, instead we get the techonological impulse (automatic & computerised is ALWAYS BETTER!) combined with the cutthroat-capitalist attitude (there’s ALWAYS more costs and services that can be cut). Woe is us. One day, our trains will be able to run without PASSENGERS, because there will be no jobs to go to, and people won’t be able to afford going to leisure destinations, and then government will mandate closure of all public services as being inessential anyway, because as Margaret Thatcher said, “There is no society”. Thanks for the reply to my question I had raised in regards to POAL and the idea you raised about the Metro Trackers running along side existing Heavy Rail Lines. It cleared up confusion and gave me a greater understanding on what was being proposed here. Now then time to lobby Council and Central Government. Also just a side issue I just got an update about Manukau and Wiri – but that is another post or email if someone wants to email me over it. That 2050 network arrangement looks fantastic! Having a concept of the ultimate network configuration defined, i believe is an essential part of the PT planning process. As it hopefully ensures that the funds spent on PT are focused and work towards the development of a coherent PT network (not spent on random & potentially conflicting projects), and to ensure that the PT infrastructure that is built is future proofed for it’s design life. The cost of these stages should be estimated, and the potential source funding identified (rates increases / government contributions / debt etc..). At which point the community should be consulted and asked whether they think the cost / time frames are acceptable i.e. do they want to slow / speed progress up based on the expected impact on their rates contributions. Once community agreement is reached the ultimate PT network & staging should be revised. Following from this the PT development program should be reviewed on a regular basis (say every 5 years or perhaps in step with the census period). Now it would nice to see AT / AC produce their vision of the 2050 (ultimate) PT network and their plan to achieve this. FYI they are working on it. Stay tuned for some exciting news this year. That’s great to hear, I really look forward to hearing about this network arrangement. Out of interest, do you know if there is a specific ‘design criteria’ or level of service and an associated targeted completion date, with which this network is designed to achieve. If so are there details available on this. Pretty much any rail system can be driverless; it is a potentially exciting technology especially for off peak frequency at low opex.